When standing in a room, the ceiling takes up a large portion of our field of vision. 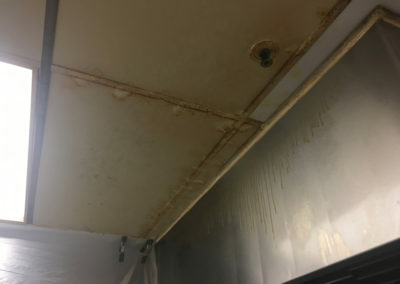 When a kitchen ceiling is yellowed, caked in grease, and unsightly, it subconsciously causes us to assume and view the rest of the kitchen as dirty and unkempt. This leads to greater scrutiny from the health department as well as from customers whom are able to see into the kitchen. Even employees are affected by this notion, which results in less care for keeping the kitchen environment clean. 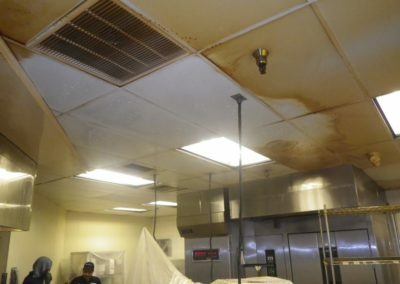 We offer our clients a solution for this by cleaning their ceilings as well as restoring the ceilings with our food-grade washable ceiling coating. A professional ceiling cleaning and/ or restoration will transform the appearance of your kitchen overnight! Many of our clients ask us what the difference is between cleaning and restoration. Simply put, cleaning is the first phase of restoration. 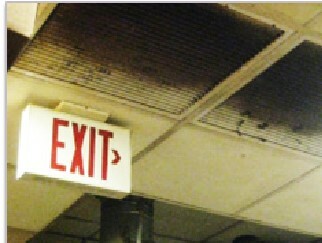 We thoroughly clean the ceiling to remove all oils, grease and other contaminants. 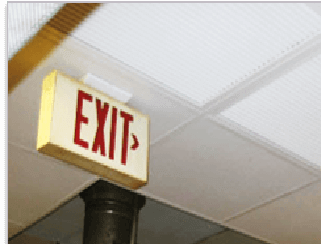 Although cleaning greatly improves the appearance and cleanliness of the ceiling, sometimes the ceiling tiles and/or grid can be permanently stained and will still have a slight yellow or pink tinge. 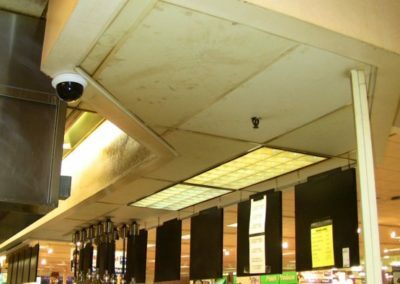 In this case, the next step to return to a new-looking ceiling is our restoration process. This involves masking the entire department similar to how you would when painting any other ceiling. We then spray the ceiling with our washable bright white food-grade paint. The result is a ceiling that is returned to a bright white and brand new appearance! HOW IS THE SERVICE PERFORMED? First, we drape plastic sheeting over all counters, appliances, shelves, and anything else that would need to be protected from the washing process. We also plastic wrap any electrical equipment like cameras and wifi routers. A solution of hot water and ceiling cleaning chemical is prepared in our tank sprayer. 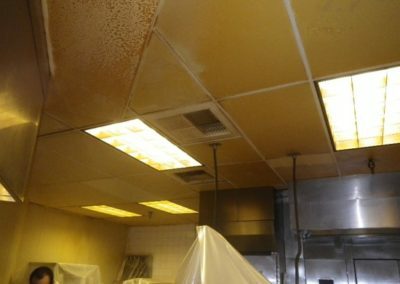 This is then sprayed onto the ceiling using a pressurized wand to chemically and physically push the grease off of the ceiling. If requested, we remove all light lenses and wash each lens by hand to restore the appearance and brightness of the lighting system. Any greasy water residue found on walls after cleaning is wiped clean, leaving clean walls. The ceiling is thoroughly dried and the light lenses are installed back into place. 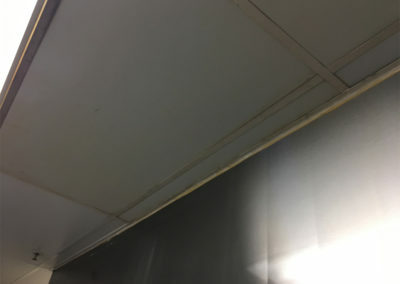 If our client opts to restore the ceiling, we now mask all walls, floors, light lenses, sprinklers, counters, equipment and anything else not to be sprayed. 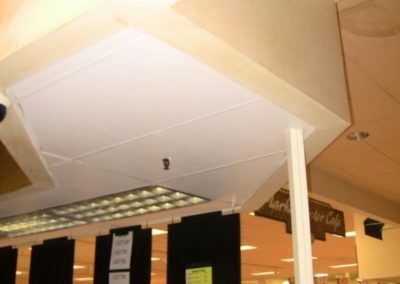 Using an airless paint sprayer, we spray the ceiling tiles, grid, air grilles, air diffusers, and other ceiling fixtures appropriate to be coated with our food-grade bright-white washable coating. Once the coverage is optimal and the ceiling is dry, we remove and dispose of all masking materials. The kitchen floors, walls, and other surfaces are cleaned and left in an orderly and clean condition.